* The lush greenery of the place, especially as it’s rainy season – palm trees, mango trees, banana plants, papaya plants, bougainvillea bushes, frangipani trees etc. * Being able to go out in just a t-shirt and not feel cold, day or night. * Fan Milk ice-creams – cheap but delicious! * The intensity of the sunshine – both in terms of light and heat. Although you can’t stay in it long, a few seconds is enough to bathe you in warmth and make you feel better! The praying mantis is, of course, famous for the somewhat unusual practice of the female eating the male just after mating. However, according to Wikipedia, this kind behaviour is not limited to the mantis, but also occurs amongst other insects and arachnids. 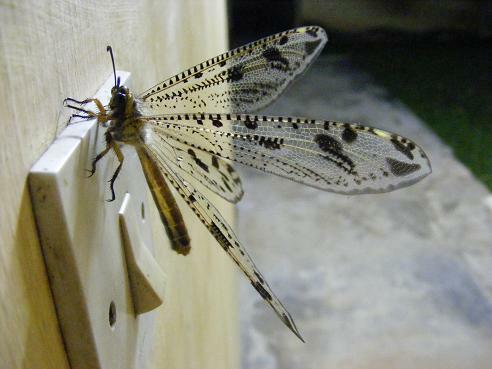 Don’t forget this post, where you can hear the amazing sounds of an African night and also this one about an interesting looking moth. Meanwhile, I’ll enjoy a few more days of Africa, then it’s back to drizzle, cold, dark nights and frost!